Norman H. “Junior” Bartnick, Jr.
PORTAGE -- Norman H. “Junior” Bartnick, Jr., 79, of Portage, passed away on Tuesday, March 26, 2019, at the Columbia Health Care Center in Wyocena surrounded by his loving family. Norm was born on April 24, 1939, in Sauk City, WI, the son of Norman and Gertrude (Hutterli) Bartnick. He married Patricia A. Kayartz on November 13, 1965 in Portage. They were married 53+ beautiful years. Norm worked as an auto technician/tow truck driver for over 45 years at Gaffney’s Standard Station, Frette’s Sales and Service, Jenkin’s Chrysler-Dodge-Jeep Car Dealership, Blystone’s Towing and Radiator and his own business Norm’s Service, LLC. Norm at times worked three jobs to take care of his family and save money for retirement. Norm enjoyed hunting, snowmobiling, fishing and camping. In his younger years he raced stock cars and Sundays he would watch the NASCAR races. Twice a year he ran wrecker at NASCAR races in Talladega enjoying every minute. Norm loved his customers and sharing his stories. He delighted in attending his grandchildren’s activities. Norm taught us to work hard in whatever we did and remember the customer always comes first. Norm is survived by his wife, Patricia Bartnick of Portage; his daughter, Traci (Scott) Hohn of Pardeeville; his son, Scot (Jody) Bartnick of Pardeeville; his grandchildren, Brandon and Austin Hohn, and Alaina and Aaron Bartnick; his brother, Mike (Sharon) Bartnick of Pardeeville; many other dear relatives; and many close friends. He was preceded in death by his parents; his brother, Dennis Bartnick; father-in-law, William Kayartz; and mother-in-law; June Kayartz. 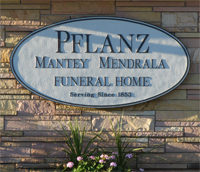 Funeral services will be at Pflanz Mantey Mendrala Funeral Home at 11:00 a.m. on Friday, March 29, 2019 with Father Mark Miller presiding. Burial will follow at St. Mary’s Cemetery in Portage. Visitation will be from 4-8 p.m. on Thursday, March 28, 2019, at Pflanz Mantey Mendrala Funeral Home in Portage. Visitation will also be held from 10-11 a.m. on Friday, March 29, 2019 at the funeral home. A special thank you to the Columbia Health Care Center and Agrace staff for their loving care and compassion Norm received.